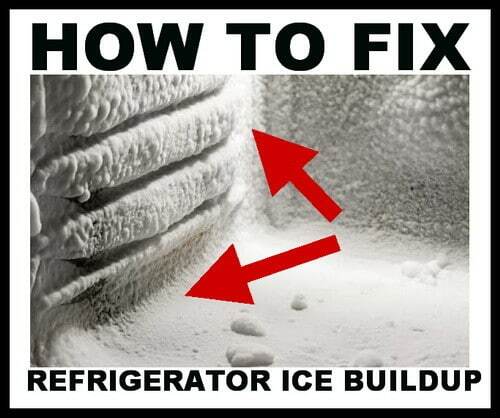 If your refrigerator has ice build up on the inside, here are a few things you can check yourself to fix the issue. A common cause for ice buildup is a faulty door seal. If a refrigerator has a bad door seal, the outside air will pass into the fridge and cause the ice build up problem you are experiencing. Another cause for this could be that the door hinges are loose or not attached properly leading to outside air entering your fridge/freezer. Check to be sure the door hinges are tight and are attached and aligned properly. Some other simple things you can do to try and remedy this issue are easy to try yourself. You can try moving the refrigerator away from the wall a little bit more to give it extra room for the air to circulate. The heat from the compressor should have sufficient room to dissipate. If the refrigerator is too close to the wall problems will occur. Another solution may be to clean the vents on the back or below the fridge as they can be clogged with dust and debris. Clogged vents cause air circulation problems that lead to many common refrigerator problems. If the ice build up is only happening in the freezer, the freezer drain is probably clogged. To unclog the drain you should first unplug the unit from the wall. Remove the freezer covers to expose the frozen drain. Pour hot water down into the drain hole until you see the water dripping into the drain pan under the refrigerator. First remove food and store it in another fridge or cooler. Unplug the refrigerator from power and remove any drawers or shelves. Wedge the door to keep it open for the defrost procedure. Lay a deep pan or similar at the bottom of the refrigerator to catch the water when the ice melts. Leave everything sit until all the ice has melted (this is a good time to wipe down the inside of fridge). After the refrigerator is defrosted and the ice is gone, clean and replace the drawers and shelves. Plug in the refrigerator back into power. Set the thermostat dial to be sure the temperature is set correctly. Once the fridge is cold you should watch for any ice buildup. Check to be sure the fridge is at the proper temperature and no ice has formed. Put the food back in the refrigerator. Periodically check fridge to be sure no more ice has formed. If your refrigerator is still under warranty, make sure to call the company you purchased it from or call the 800 number of the company who manufactured it and schedule service. Find out if it is under warranty before doing repairs as doing repairs yourself could void the warranty on the unit. NOTE: At times a powdery type of ice will form in your refrigerator if it is being repeatedly opened and closed. Keep this in mind as your only issue may be this and no repairs are necessary. Other things causing this issue could be a defrost timer, bad temperature sensor or bimetal defrost thermostat. In this case you will most likely need to call a repair person or find someone who is experienced with diagnosing appliance faults and removing and replacing components. Have experience with ice buildup in your freezer refrigerator? Please help out everyone who seeks information on this page by leaving a comment below. I have a BEKO fridge no frost Freezer, I have notice that the fridge is icing up on the back wall in the middle of the fridge. I have emptied it out once already and left the fridge off for 24 hours getting rid of the ice, I have emptied the water tray at the back of the fridge but now a month later it is happening again. Can someone please help. The temperature is set at four as I found that things were not keeping very cold in the fridge but at four it is perfect. I have a 4 year+ old Bosch fridge freezer ( KGN39NW20/01). Over the month or so very thick blocks of ice are buiding up at the bottom of the freezer. I note a white coil at the back – is it a waste pipe clogged? Or a mechanical/electrical fault with evaporator? My Maytag refrigerator freezes in the door mainly at the top. Gasket was changed, coils are clean, but the ice builds along the 2 trays on the inside of the door and have condensation in the containers storages in the refrigerator. The technician said that the temperature control need to be changed. The refrigerator is about 10 yrs old. I have a Kenmore side by side refrigerator/freezer model no. 106.56532400. Ice forms on the bottom of the freezer, so I turn the unit off, take the food out of the freezer and melt the ice with hot water. When I see water dripping into the collection pan in the back of the unit, I put everything back together, add the food and plug the unit in. I have done this several times but the ice continues to build up on the bottom of the freezer. The vent to the refrigerator is clear. Dust is not the problem. Any suggestions? Hello, we have purchased Panasonic Refrigerator 215ltr model NR-A221STSFP / A221STSSP. We found there is huge ice buildup in the deep freezer & faulty door close.. Door is not properly closing ( little bit curvy). How can we solve this faulty door problem? I have a Whirlpool refrigerator (gold edition), double doors and ice and water thru a little window. Recently, I see a little ice cover at the bottom of freezer and the ice cover outside the fruit/veggie clear cabinet (at bottom of fridge side), and the fan keep running (instead of stop then go again) I would like to have a suggestion what cause it? The temperature sensor or compressor? What is the model number on your Whirlpool refrigerator (gold edition)? NOTE: It is usually located on the inside door panel or in freezer area. I need to call the maintenance people in the Apartment complex for ice build up. It is about every 1 1/2 months for almost a year now. I thought these new ones are supposed to be frost free. The repair person said problem is due to air vents being blocked. How to clean out a frozen freezer drain hole and tube – it worked! Thank you! It is possible that you have an issue with the defrost timer which tells the fridge when to go in and out of defrost. If this unit fails, then you will have the ice build up over and over again even after repeated “manual defrosts”. The timer is usually built into an electronic board which contains very sensitive components which can and do go bad especially in an area prone to power surges. I have frost and ice build up in vents behind meat drawer of my Kenmore Elite Refrigerator. I have thawed the ice twice. Now it needs it again. This shouldn’t happen in an expensive refrigerator. How can I prevent this from happening again? Is it worth calling a Sears repairman, or is this a perennial problem? I have a Samsung model RM255LABP, the bottom freezer drawer is always having a thick sheet of ice, in order to open the drawer need to apply pressure. Need to defrost every other month. Our assumption would be that the Amana Deepfreeze has a defrost timer issue. Replace the defrost timer and it should fix your issue. We need the model number to point you in the right direction for parts. The number IA52204 is not the model number, that is actually the company State and Zip Code. I purchased the Amana Freezer March 2002. I experienced and solved an ice build-up issue with my 4 year old Whirlpool side by side on the freezer side (ED5VHEXVQ04). Before proceeding with what is listed below with the unit still plugged in, open the fridge compartment and check to see if you are getting air flow from the units left side mounted air diffuser. This is a small vented apparatus that allows cold freezer air to circulate throughout the fridge compartment….mine had ZERO air coming out. I surmised that since I could see the ice buildup on the freezer side that the ice could me a possible issue. A possible failure in that little diffuser box was also a possibility as well as possible defrost component system failure(s) as well. As always regardless of how minor, please unplug the unit. I then used a shop vac to blow & vac dust away from the fins in the bottom front of unit after the removal of front, & possibly the rear sturdy cardboard panel may be necessary). Yep I made a mess in the kitchen area with the flying dust! The rear fin access panel is located towards bottom on the back side of course. Remove food and all shelves in the freezer compartment to include ice bin and the rectangular metal ice auger turning assembly located at the rear and directly behind the ice maker by taking out the four screws near all 4 corners (not sure what the exact name for that part would be) and unplugging it’s wiring harness. This is the unit that houses the light bulb. I then removed the upper air duct housing that funnels cold air from freezer to fridge compartment (again a very easy thing—- a few screws and it pops up). You may have to remove the right screw holding the ice maker down, and loosen but don’t remove the left screw, this will allow for the upper air duct panel to clear the ice maker water inlet tube. I proceeded by then dropping the thin sheet-metal freezer rear wall panel (very easy 4-6 screw job). This will allow for the rear coils of the freezer to be exposed, you will want to do this because it will eliminate the guess work involved with trying to figure out if you’ve thoroughly melted all the ice from those coils. Not to mention it will also allow for quicker melting of the ice as well. It may be necessary to remove the “single screw held” three shelf holders on the right side of freezer compartment to ease the removal of this panel. Next I used a very low wattage small heater sitting just inside the bottom floor of freezer aimed at the frozen coils and the ice completely melted in well under an hour. I would suggest a bit of caution here as NO amount of water or ice should ever be allowed to melt onto, or come anywhere remotely close to the heater as it does its thing. Please note also that while the heater is on, make certain that no internal components to include any fragile sensitive plastic parts are exposed directly to the heat that may melt, or warp them. This was not even remotely an issue with my model and may not be with yours but thought I would mention. Some other models may/may not have restricted spaces which would rule out this heater technique all together. A hand held hair dryer would suffice but you will have to be patient as it would take it longer to do the same job. Word of caution: Drop that ice pick or screw driver….. NEVER manually chip-away at the frozen ice….NEVER! After a while even though it was obvious the ice had melted, I allowed the heater to continue going for some time to leave no doubt. I then removed the heater and while leaving the components briefly disassembled, plugged the unit back up, to check the condenser fans operation to insure it was working as it should. Unplugged unit once again, put everything back together and using a digital upright thermometer on the fridge compartment and an analog dial type for freezer, checked the temps after approximately 1 hour and several times afterwards to insure that things were proceeding OK. This did the trick! Air was also now flowing properly through the fridge’s left mounted air diffuser as it should. No icing or air flow issues and it’s been several days after the fact, long enough to where if I had issues with the defrost components it would have reared its ugly head by now. Freezer runs between -1 to 10 degrees F, the fridge is consistently within normal range as well 35-44 F depending on how I adjust setting. YEAH!!!! Summary, I believe this whole issue was a possibly result o two things. I can remember going through one of the major holidays and absolutely packing both the fridge, & fridge units’ chock of food, and full possibly blocking its flow of air. The other possible problem could have been an over accumulation of dust on the units fins underneath front, & rear kick panels as mentioned above. Hope this can help someone! Howdy – I recently purchased a 7.1 cu ft chest freezer. It’s mostly empty at present, but I read that filling it with containers full of water can make it more efficient. I don’t have many jugs/containers, but I do have deep plastic trays (ie, no lid). Would you envision a downside to using these in place of plastic gallon jugs (or something with a top)? Ie, since the water is exposed, might it caused frost to build up more quickly? Thanks! If you are going to fill up your empty chest freezer with containers of water (ice) to save energy, we suggest to NOT use open containers. Use large 5 gallon jugs that have a cap or lid. Check this page here as there are hundreds of Refrigerator Fans to choose from. Hotpoint fridge with inside top freezer ice maker freezing up and water dripping down inside the wall of the fridge. How to fix this problem? I have Whirlpool refrigerator model number GD25DI too much ice is building in the freezer. Please tell me can I do? Have you tried the methods above? Where in the freezer is the ice building up? The back, sides, bottom? Have you recently moved the refrigerator? What is your Whirlpool refrigerators approximate age? Is the fan in the freezer running as it should? Have you tried a manual defrost? Can you check the internal parts with a meter to be sure they are working properly? Defy C315 – freezer cold but fridge section warm. Thick ice build up but now I have manually defrosted. I’ve read about the freezer to fridge vents being possibly blocked by ice build up, food, debris etc causing air restrictions which may be causing fridge section to be warm. I can’t however locate these vents I keep reading about. Even removed panel with temperature control in fridge where I’ve read it may be one of places where it might be located. Can someone please confirm if Defy C315 works on same freezer to fridge vent system and if so where to locate them to check if they are blocked or stuck in closed position? Question: How do I repair ice build on the freezer bottom and eliminate water on the floor underneath the freezer side? I have a Maytag Plus, model MSD2756GES. I’ve also noticed an ice build near the slots for making and dispensing ice for the ice bin. Thanks for any assistance you can provide. You may have a defrost issue. You should test either the defrost timer or possibly the main board has an issue. If you have ice build up then it will defrost and melt and go on your floor as you stated. Check into the defrost timer to see if it is part of the main control board or a separate component. You could try to manually defrost your Maytag fridge and let all the ice melt, then plug the fridge back in after it has completely defrosted and see if that may reset any issue. Let us know what you find. Have the same problem with a Defy DFC406. Ice buildup on the fridge part in a square pattern at the back. Drainage hole is open. It don’t reach lower than 10deg Celsius, especially in summer, even on top setting. Battling to get our house temperature lower than 28deg C. In winter, not really a problem. Already de-freezed it few times. Could heat or ventilation be the problem? We live in the southern part of South Africa. In Des and Jan our outside temperatures stay mostly above 40deg C.
Have you tried the steps above on this page? Ventilation may be a problem. Have you made sure both fans in the fridge run? Hi there. I have a Defy fridge/freezer (freezer below) which is building on the back wall of the fridge. It doesn’t appear to be the seal or the vent system. Any thoughts? Are you saying the interior rear of the fridge is getting ice buildup or in the freezer? Which portion? How thick is the ice buildup and does it form in a certain pattern? Is the fridge and freezer working properly despite this? Can we have the model number of your Defy refrigerator? I live in a rented flat and I experience ice buildup in huge quantities (more than 5 cm over 4 months) during the summer period in my fridge, which is installed directly on the wall facing directly the sun. Just opening the door wouldn’t thaw it in a reasonable time, so I filled some bowls with hot water, put them inside and closed the fridge. Repeated that after 20 minutes and the blocks of ice came lose pretty quickly. Needed to defrost an older refrigerator. My parents asked me to defrost their fridge for them while they’re on vacation. They’ve had the same fridge for the past thirty or so years, so they have to defrost it manually. 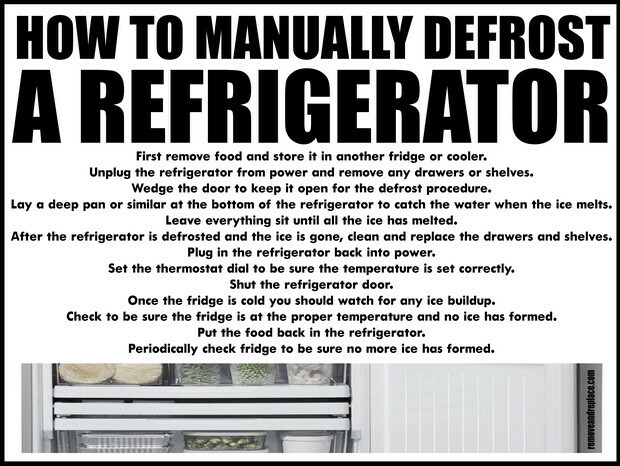 I’ve never had to defrost the fridge, so these instructions will help me do it correctly. It’s a good thing that you listed instructions to set the thermostat dial to the correct temperature. I would have forgotten to do that right after plugging the refrigerator, so now I’ll remember to do that. I think that a lot of times my fridge gets pushed back against the wall too much. It always seems that any issues always are from the simple things. I like that you give a lot of options to look at before I need to look for a repair guy. How can you get rid of the ice blockage once it’s already formed in the fridge? Should you let it melt or try to chip it away? You have great ideas on how to prevent it from happening again, but I need to know how to get rid of the ice that’s still in my freezer. It’s kind of a mess. Defrost the complete fridge freezer and go from there. Thanks for the tips! There’s a lot of ice buildup that’s been in my fridge for the past few years. I’ve always meant to do something about it, but I never knew how to go about defrosting a fridge myself. It’s good to know that all it takes is unplugging the fridge, letting the ice melt and drain from it, then reset the temperature to the correct settings. I didn’t know that the reason for all of that ice build up was caused by the settings that I use for my fridge. What’s the correct temperature for my fridge so that I can prevent any extra ice from building up? I would like to avoid having to manually defrost my fridge a second time if possible. Ice buildup on both fridge and freezer walls? Please explain in detail and provide model number. I have a GE Refrigerator and the back of the freezer wall keeps getting ice build up. The model number is 197d6467poo1. Is the refrigerator still working properly besides the ice buildup? There may be a defrost issue with the fridge. Have you tried manually defrosting the refrigerator for 24 to 48 hours, and then restarting the fridge to see if that may reset the fridge? If not you may have a board or defrost timer that is malfunctioning.